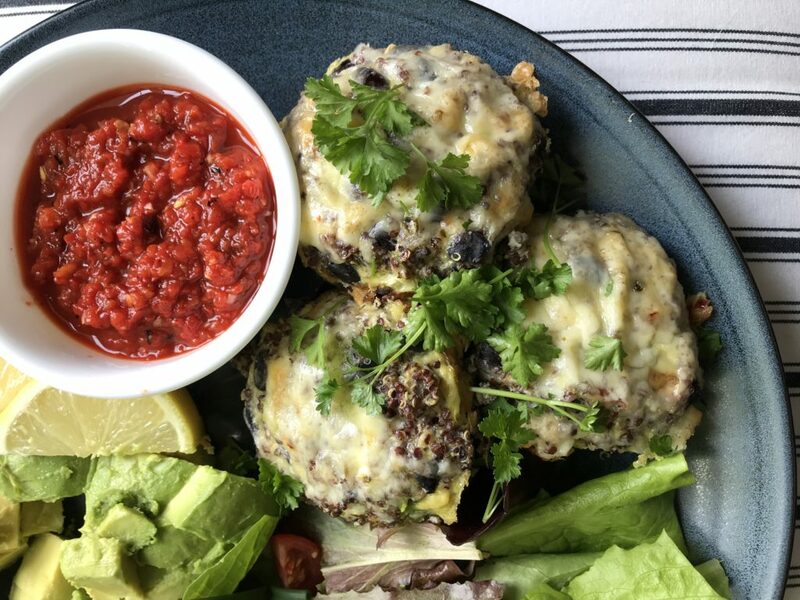 The bright fire roasted peppers look so vibrant along side the paler quinoa cakes and cheese. 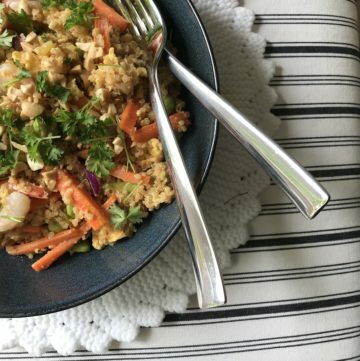 Are you looking for more ways to use quinoa? Or do you want to increase protein in your diet? Than this is a recipe for you! 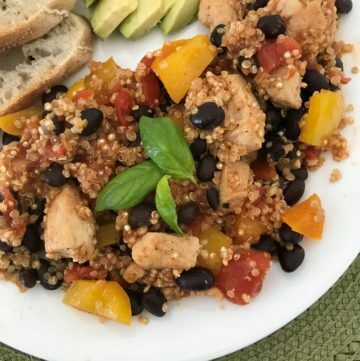 It is packed with protein from the black beans, eggs, cottage cheese and quinoa. I used red quinoa as that is what I had on hand and I must say it looks very appetizing. Any quinoa will do, just use what you have on hand. The salsa recipe is spicy but adds a nice bright sauce. 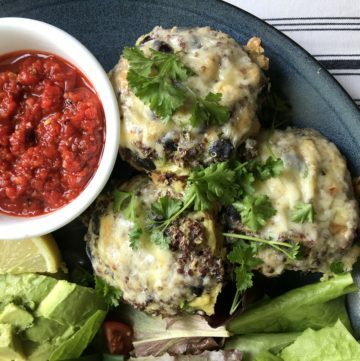 The quinoa cakes are very filling and make a complete meal served with a nice fresh salad. Avacado is a luscious creamy side and if you add nice crisp tortilla chips, you’ve got all the textures covered. The cakes keep very well in the refrigerator for four days and make an easy portable lunch option. I have to admit that Southwest cuisine hasn’t made a big showing in Canadian cuisine. Italian food seems to have dominated in the last decade but I must say I am ready for a change. Judging by this recipe and other foods I’ve tasted I hope that we start to see more of the Southwest/Mexican flavors. At first I wasn’t sure I’d be able to find the tomatoes and peppers but they were readily available at my local grocers. The rest are pantry staples. Preheat oven to 375 F. Coat a 12 cup nonstick muffin tin with cooking spray. 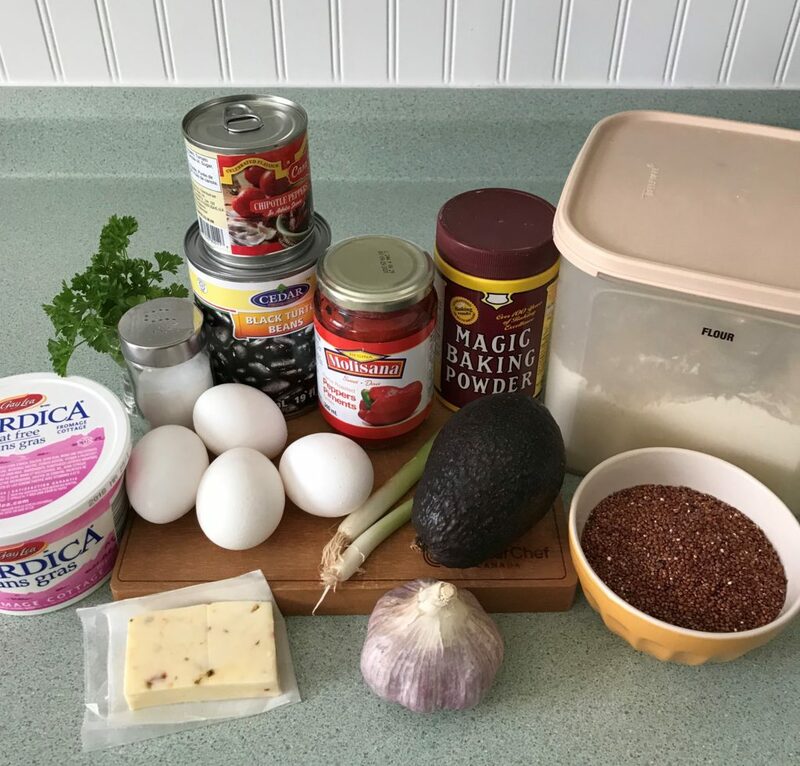 Add eggs, beans, cottage cheese, green onions, flour, baking powder and 1/4 teaspoon salt to the quinoa and stir until well combined. Divide the mixture among the muffin cups. Top each quinoa cake with about 1 tablespoon of cheese. Bake the cakes until puffed and a little brown on top, about 20 minutes. Let cool in the pan for 5 minutes. Gently loosen and remove with a paring knife. While the quinoa cakes are baking place the tomatoes, garlic and chipotle pepper in a blender and puree until smooth. Transfer to a small bowl and stir in parsley. Serve the cakes with the salsa and avocado. Make ahead tip: Make the salsa up to 3 days ahead and store covered in the refrigerator. Or even easier use a purchased salsa. There are so many kinds now and they are delicious.